Democrat Stacey Abrams boasted Sunday about the huge voter turnout increases among various demographics for her Georgia gubernatorial run, in the same interview where she also complained again about voter suppression and said Republican Brian Kemp's victory was "stolen." In an interview with liberal MSNBC host Joy Reid, Abrams discussed her campaign's achievements in garnering nearly two million votes in Georgia against Kemp, albeit in a losing effort. "I ran a race where … we tripled Latino turnout, Asian-Pacific Islander turnout, increased youth participation rates by 138 percent, increased black turnout by 40 percent, and I got the highest share of white voters in a generation," she said. "It is not a zero-sum game, and we have to remember that winning elections is about building the largest coalition possible." 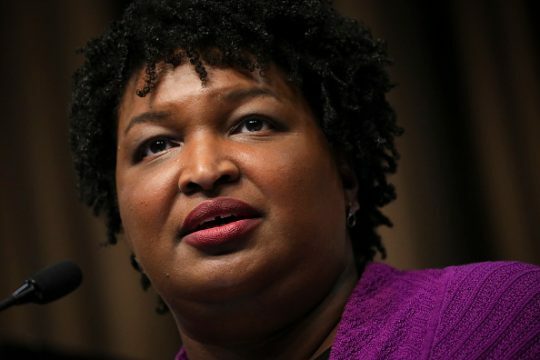 Earlier in the interview, Abrams said "voter suppression," on which she has repeatedly blamed her loss, was not endemic to Georgia, and she also said Kemp's win was "stolen" from the Georgia voters. "The process that took place during the legislative cycle was one that … did not pay attention to the deep and real concerns of those who watched this election be stolen in the state of Georgia, and again, when I use the word stolen, I'm not saying I absolutely know I would have won, but we know that thousands of Georgians had their voices stolen because they were not able to cast ballots and they cannot be guaranteed that their votes will be counted in 2020 if we don't do this right," she said. Georgia voter turnout surged from 43 percent in 2014, the last governor's race year in the state, to 57 percent in 2018. Abrams also earned more votes than Hillary Clinton got in Georgia in 2016. Abrams has ridden a wave of good Democratic feeling following her narrow defeat at Kemp's hands in last year's race. In the closest governor's race in half-a-century, Abrams lost by less than 55,000 votes but failed to force a runoff as Kemp continued a Republican state-wide winning streak. However, Abrams has refused to officially concede she lost, saying "we won," accusing Kemp of systemic voter suppression tactics, and saying the race was "stolen" from the voters of Georgia. Fact-checks by the National Review, the Weekly Standard, the Free Beacon, and the Washington Examiner have belied those claims. Abrams said she is "very seriously considering" running for president, although she has said in other interviews she doesn't feel she needs to make a decision before September. This entry was posted in Politics and tagged Brian Kemp, Georgia, Joy Reid, MSNBC, Stacey Abrams. Bookmark the permalink.